Published on March 7, 2009 by Wade Shepard Follow me on Twitter here. My friend Craig at Travelvice.com ribbed Vagabond Journey.com with a humorous little jest about the regional location thumbnail maps that I have begun including within all of my travelogue entries. It was perhaps well deserved, and it made me laugh. I suppose ol’ Craigy is correct in asserting that the inclusion of two maps and text that tell of my location is a little redundant. So I will now draw out my planned route with distance markers on the regional thumbnails – so that with a single click readers can see where I am and where I am planning on going. Even though I am getting picked on for this, I still hold strong to my theory that it is good to have regional maps within each entry so that it is completely transparent where they are written from. 95% of the place names on the planet have no meaning to 99% of the people on earth. Outside of the major cities in a country, it is reasonable for one’s geographic senses to become a little opaque. 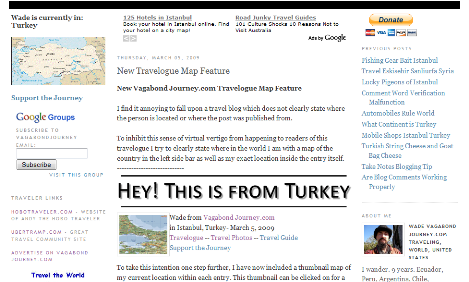 I have included the regional thumbnail maps so that every travelogue entry can be easily provenienced with a single click. My next stop is Eskişehir. Who in the world knows where Eskişehir, Turkey is? I didn’t, well, until I looked at a map.